This started out as the 1:32 scale t.d Plymouth Duster funny car, formerly known as "RRRRRRIPOFF"
The story is that I was talking to Dan Barten one day, and I said something about the little t.d. snap tite funny cars. One thing led to another, and Willis Pierce told me that he had one he would give me. 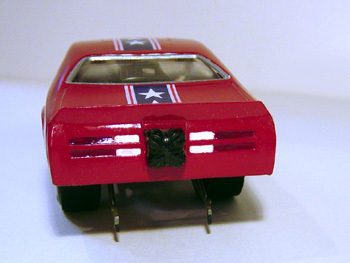 Again, talking to Dan Barten, i found out that Willis was going to try and build this little car into a 1:32 scale replica of The Mongoose Dodge charger to match his 1:25 scale one. Willis didn't have the time to do it, so he said that he would give it to me. So, Willis sent me the little Charger and it was in pretty bad shape. The body had been brush painted with flat black and silver paint...it was thick. I stuck it in a bowl of c.s.c. to strip the paint off. The chassis was also brush painted flat black, so I stripped that paint off as well with c.s.c. Once the body was free of the paint, I had to fill in the holes with spot putty on the rear fenders because the little wings were missing. Once that was done, i sprayed the body with gray primer, and then painted it with Krylon Red Pepper enamel inside and out followed by clear laquer. I painted the wheels, injector scoop and valve covers with aluminum. I painted the blower, intake manifold and headers steel. I left the chassis in it's molded silver plastic color and painted the fuel tank straps black and fuel caps red. I painted the seat flat black with silver seat belts. I left the engine block and rearend in their molded black plastic color. I painted the transmission, oil pan and rearend cover silver. If i remember correctly, i had to use a 1:25 scale funny car steering wheel because the original was missing. The rear slicks are small 1:25 scale one peice vinyl ones, and i sanded them down. i lettered the tires with flat white (something i don't do very often). I detailed the grill, headlights and window rivit trim in silver, rear tail lights in dark red, and reverse lights in flat white. Once again, Dan Warford comes to the rescue with decals. He scaled down a full set of original Mongoose funny car decals to fit onto this little 1:32 scale body...and they are excellent. For the final surprise, I sent this car back to Willis Pierce, and he had no idea that I was going to do that. He was totally surprised when he opened the box. It was very hard for me to keep this a secret, because it came out so nice. I think everyone but Willis knew what was going on. It felt really good to do this as a surprise for Wiliis...and I am pretty sure that this little mongoose is sitting right next to it's big 1:25 scale brother in his display case.